Office has literally became a butcher place where every ounce of energy get butchered in the period of 5 days. On top of that the sword of the weekend getting spend in the office too is always there!! This Saturday, a big thanks to my TL for not calling for work (there was every chance of it happening!!). Had a chat with Sid at around 9:20 in the morning. Initial plan was to ride to Karol Bag to surf some options for upgrades for our bikes. 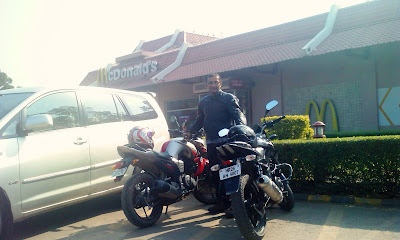 I kept the phone down and instantly he called back again..... idea...... let's first ride to Manesar Mc Donald's and have breakfast over there!! I was like.... hmmmm man this dude has some idea.... and instantly we were like lets meet at IFFCO chowk in 30 mins. BANG!! 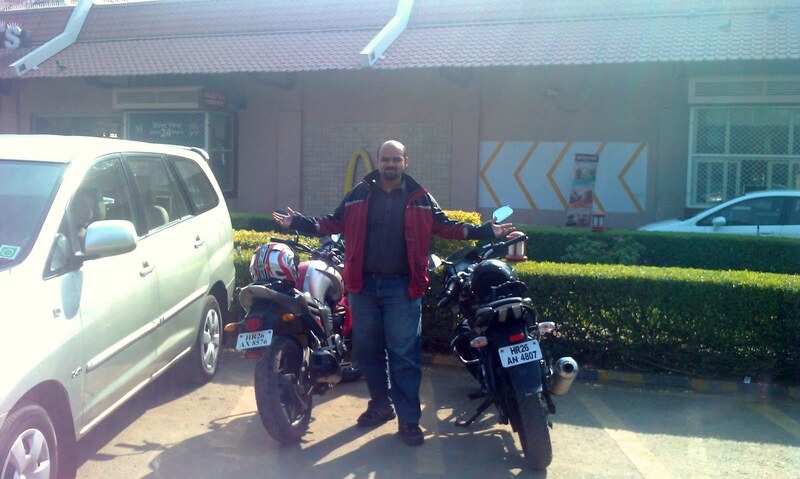 we were at IFFCO chowk and we started our ride. Since the Express Way is closed for two wheelers, we decided to avoid any uncomfortable situation and avoided the Express way until the Dharuhera Toll Plaza (man reaching upto the Toll Plaza was some effort with the poor condition of the roads and nasty traffic). Well after the Toll Plaza the remaining 6 km got over in a couple of minutes. 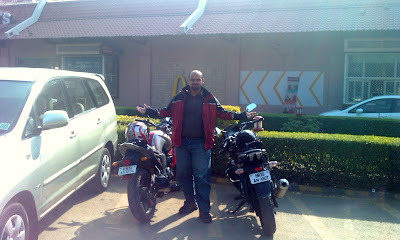 We never touched 100 kmph for the sake of it coz we wanted to enjoy the early morning ride. We reached the Manesar Mc Donald's. First look, the design and build up of the Mc Donald's was very much on the lines of it's Western Branches and really it was a pleasant site. Lot's cars and crowd was also pleasant ;). Sid was saying normally there are many R1, GSXRs parked around but yesterday non were around!! From morning 7 am to 11 am, only breakfast menu is served!! A very Westernised menu one should say!! Sid went for the Veg breakfast platter and I for the Non-Veg breakfast platter both of them costing Rs.99 each. I must say both of us really enjoyed the breakfast, with Hash Browns with Jelly, Egg, Chicken Sausage, Pan Cakes with Maple Sauce and Butter, Aaloo Patty and a hot Cappuchino!! 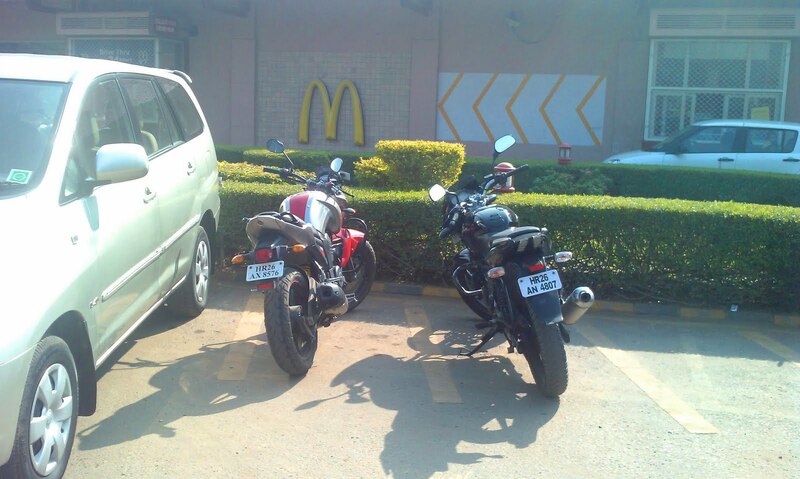 From my side, the Mc Donald's break fast menu gets a full thumbs up. On the other hand the outlet even though very nicely developed and the ambiance is also good, does not accept card and very bluntly ask only for cash which was not kinda cool. So, if planning to go for this outlet you better have cash.